15 kwietnia w czeskiej Pradze odbyła się konferencja podsumowująca projekt „Praga współdzielona czy rozdzielona” realizowany przez Multikulturni Centrum Praha (CZ), i którego Stowarzyszenie „Pracownia Etnograficzna” było partnerem. W konferencji uczestniczyła Anna Czyżewska, Prezeska SPE, która mówiła o naszych doświadczeniach w pracy z audioprzewodnikami. 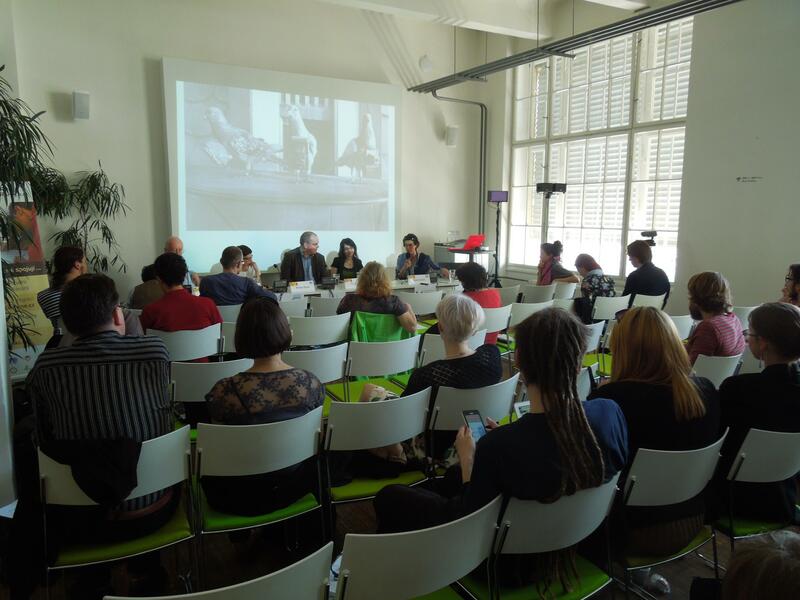 On Wednesday, 15 April, Prague’s Multicultural Center (MKC) held a conference entitled Prague Shared and Divided: Intercultural Memory in the Public Space. MKC’s director Marek Čaněk greeted about seventy attendees and presented the Prague Shared and Divided project which focuses on the legacy of Prague’s multicultural history in the 20th century: „Having been inspired by the historian Ines Koeltzsch, we want to relate the history of both the ethnic and social conflicts and the divisions of society, as well as the sharing and everyday life in the public spaces.” He spoke about the afternoon program as well as plans for the future. „Prague Shared and Divided is no longer just a project, but is now a whole program of MKC, which we want to develop further,” said Čaněk. He then turned the floor over to Kateřina Hamplová from the Office of the Czech Government, who is a representative of the Europe for Citizens EU program, which provided the bulk of the finances for the Prague Shared and Divided project. Sociologist Csaba Szaló from Brno’s Masaryk University gave the opening lecture. He spoke about the modern-day obsession with the past in urban spaces, focusing specifically on ruins and their role in today’s society. He emphasized that our relationship to urban ruins is not only a way to connect to the past, but also shows our view of the present and the future. In his lecture, Szaló asked if ruins allow us to see the problematic and contradictory character of the 20th century, during which next to „positive modernity” that promised a better future there was also „negative modernity”, which led to the catastrophes of the two world wars. The interaction of the dynamics of hope and the dynamics of catastrophe can be used, according to Csaba Szaló, not only to critically reflect on modernity, but also to draw connections between the past, present and the future. Anna Lénárd from Budapest introduced the block of lectures focused on the use of guided walks as one of the methods to discover an intercultural city and historical memory. She briefly introduced the Budapest Walk Shop, saying that she understands the walks around the city with her colleagues as a particular form of artistic expression, which incorporates various elements from descriptive narration, to emotional and sensory aspects of perceiving a city and creating emotive bonds with buildings. For Lénárd, a guided city walk is above all an opportunity for discussion and sharing of experiences – it is not as important whether you learn something new or not. The panel discussion that followed, which was moderated by Anna Lénárd, included Eva Bendová from the National Gallery in Prague, Richard Biegel from Klub Za starou Prahu (Club for Old Prague), Anna Czyżewska from the Warsaw association Pracownia Etnograficzna (Ethnographic workshop), and journalist Petr Brod. The discussion covered a number of topics including changes in city districts and the often incongruous layers of the past, which can be discovered during the walks; the structure of the walks and how they are led, the differences between the more conservative and progressive ways of showing a city; how the experience of being a ‚guide’ on such walks influenced the individual participants in their subsequent work. An important output of the Prague Shared and Divided project are the memory maps of Prague and Warsaw. The next block at the conference was thus focused on memory maps and various approaches to their creation and presentation on the internet. Jérôme Segal (The Vienna Project) also spoke about artistic activities happening in the streets of Vienna. The map created by the project that is available online was created more as a work of art rather than an educational interactive map. A project that was presented by Olha Zarechnyuk (Lviv Interactive Project) was, on the other hand, based primarily on the interest of the creators in architecture and art history, which became a link to a variety of other topics (archives, famous personalities, interviews, organizations, maps, photographs). Anna Pokorná from Multicultural Center Prague explained why her organization decided to focus on history, and presented the recently launched interactive map of Prague and Warsaw. Over time, new topics will be added to the map, which is conceptualized as an open platform which new individuals, organizations or schools can join and thus contribute to mapping the past and the present of multicultural Prague. Miloš Vojtěchovský (Sounds of Prague) presented an alternative way of creating virtual maps of cities, namely an open audio map of Prague, which currently contains more than 960 contributions from 40 people and tries to capture the sound of a place as the object of attention. One of the topics of the subsequent panel discussion was to what extent we should talk about the historical manifestations of discrimination, xenophobia and racism as we try to fight these phenomena in today’s society. Jérôme Segal underlined the role of modern art, especially art appearing in the streets, „since people that should learn about these phenomena first of all, probably do not often go on guided walks and look at website of these types of projects”. Michal Valach (Milan Šimečku Foundation) also took part in the panel discussion and described a similar project in Bratislava, which is still in the early planning stages and aims to show the current multiculturalism of the Slovak capital. 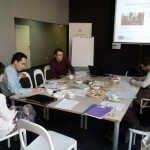 The last part of the conference was dedicated to research and educational activities that accompanied the creation of the memory map of Prague, as part of the Prague Shared and Divided project. Roma Studies expert Romana Hudousková made a presentation that explained how the elements on the map dedicated to the history of Prague’s Romani community were compiled. Because an important part of this process was recording interviews with witnesses of the times and events, one of them, Olga Fečová, also attended the conference and spoke about her memories of the Romani community in Prague after World War Two. The next presentation by Tereza Rejšková demonstrated didactic methodology of teaching about Wenceslas Square in Prague, which was developed in the course of the project in cooperation with the historian and teacher Milan Hes. Tereza Rejšková outlined the main perspectives of the methodology (time, space, people and significance of places) and presented the worksheets created for teachers and students. The last two presentations at the conference were focused on the research and educational activities that came out of the work concerning places connected to the persecution and murder of Jews and people considered to be Jewish. Jakub Mlynář (Centrum vizuální historie Malach) briefly introduced the Visual History Archive of the USC Shoah Foundation, which contains more than 53,000 audio recordings of interviews with witnesses and is fully accessible for researchers, teachers and others at Charles University in Prague. This archive was one of the sources used by students at the Lauder schools to prepare information about German refugees that was incorporated into the Prague Shared and Divided memory map. 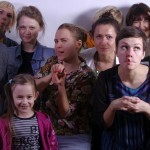 The final presentation was actually done by these students under the direction of their teacher Klára Kuběnová. 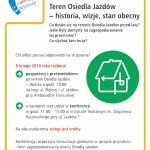 Konferencja odbywa się w ramach projektu „Praga – współdzielona czy podzielona”. Projekt „Praga – współdzielona czy podzielona” został sfinansowany przez Unię Europejską w ramach programu „Europa dla obywateli”. Projekt jest realizowany przez Multikulturni Centrum Praha (CZ). Partnerami projektu są: Stowarzyszenie „Pracownia Etnograficzna” im. Witolda Dynowskiego (PL), Malach Centre for Visual History (CZ), Nadácia Milana Šimečku (SK), The Danube Memorial Ein Verein zur Errichtung eines Denkmals (AU) oraz Adalbert Stifter Verein e.V. (DE).